Over on our store we now have a limited amount of “Low Power V2” RTL-SDR dongles available for sale for $16.95 USD incl. free international shipping. These are dongles that were produced for the Stratux project which aims to provide a very low cost ADS-B and UAT receiver for small airplane pilots. 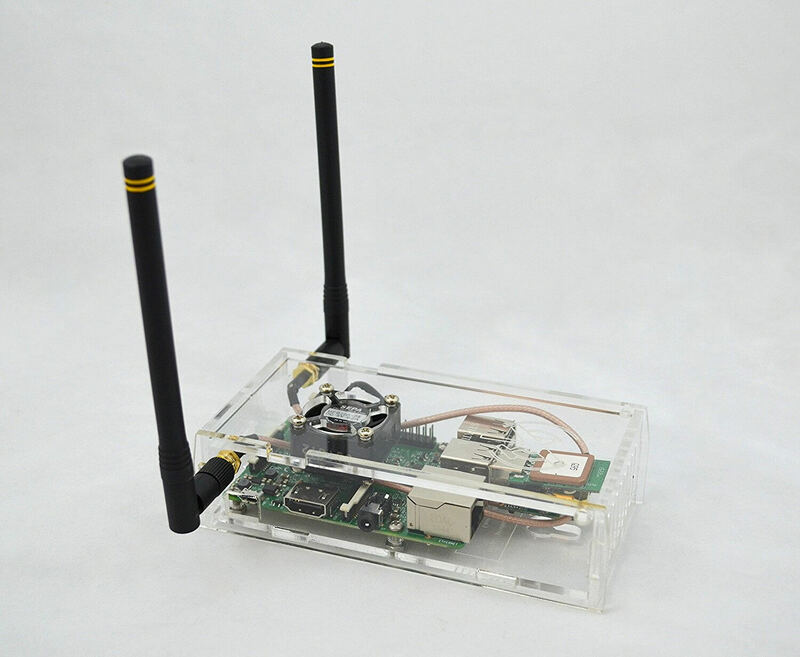 These Stratux kits typically consist of a Raspberry Pi, two nano RTL-SDR dongles, a GPS dongle and a Android or iOS tablet. The two RTL-SDR dongles receive both 1090 MHz ADS-B and 978 MHz UAT which are decoded on the Raspberry Pi. The Raspberry Pi then sends the decoded aircraft position and weather data to the tablet via WiFi which is running commercial navigation software. A full Stratux setup including: Raspberry Pi, two RTL-SDR nano dongles, GPS module, fan, and 1090 + 978 MHz antennas. One issue that Stratux users continually run into, is that the Raspberry Pi is sometimes unable to power two or more RTL-SDR dongles. When running a Pi with two RTL-SDR dongles, a GPS dongle, and cooling fan the total power draw is above 1A which can cause power supply problems and glitching. By using a low power RTL-SDR these problems can be avoided by keeping the total current draw under 1A. The Low Power V2 Stratux RTL-SDR’s draw about 160-170 mA, whereas standard dongles draw about 260 mA, so that’s a saving of almost 100 mA. On battery power this current saving can mean a few hours more of operation. The Low Power RTL-SDR dongle achieves its lower current consumption by using a switch mode power supply instead of a linear regulator which is commonly used on most other RTL-SDR dongles. The trade off is that switch mode supplies are inherently RF noisy, so increased noise can be seen on the spectrum. Despite the increased noise, most applications like ADS-B are not significantly degraded. We have seen switch mode supplies used on some other RTL2832U dongles sold in the HDTV market as well. For example all the R828D based DVB-T2 dongles that we have seen use switch mode supplies as well, and also draw about 170 mA. We think that these low power RTL-SDRs could be useful in other non-stratux related applications too. For example, they could be used on mobile Android devices. One of the key problems with Android usage is that RTL-SDR dongles tend to drain the battery quickly. They could also be used on solar and battery powered installations to help achieve longer run times. Or like with Stratux they could be used on a Raspberry Pi running other applications, to ensure that multiple dongles can be attached. Currently we are selling these dongles for $16.95 USD with free international shipping included. Note that these dongles do not come with an enclosure (just a bare PCB), and they do not have a TCXO. Below is more information about these dongles. Back in November 2016 we posted a review on the Low Power V1 dongles. Since then Chris (the man behind producing these dongles) has brought out the Low Power V2 models which improves upon V1 significantly. By switching to a 4-layer PCB the dongle is now much quieter in terms of RF noise produced from the switch mode power supply, and it also now runs significantly cooler. The dongle also now uses even less power and is more sensitive compared with V1. Over on his Reddit post Chris compared his Low Power V2 dongle against the Low Power V1, a generic nano dongle and a NESDR Nano 2. In terms of noise plots, the generic nano dongle was the quietest, with the low power V2 dongle coming in second. Interestingly the NESDR Nano 2 was almost as noisy as the low power V1 dongle. The improvements on the low power V2 dongle make it usable on VHF now. Noise Floor Comparisons between four Nano styled dongles. NESDR Nano 2 (Blue), Generic Nano (Orange), Low Power V1 (Gray), Low Power V2 (Yellow). In terms of heat produced and power used, the NESDR Nano 2 is the hottest and most power hungry, followed by the Generic Nano, the Low Power V1 and then the Low Power V2. For comparison the NESDR Nano 2 draws 1.362W of power, the generic nano 1.318W, the Low Power V1 1.003W, and the new Low Power V2 draws only 0.933W. 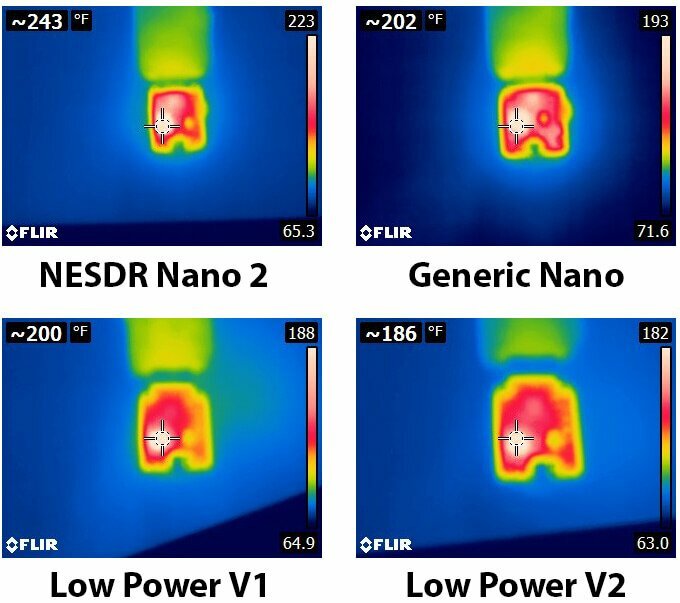 Thermal Camera Photos of four Nano Dongles. The NESDR Nano 2 loses in pretty much every aspect except for noise floor on VHF frequencies compared against the Low Power v1. You can see the effects of heat on the R820T2 above 1.4 GHz. The “Generic Nano” was always a great performer in terms of sensitivity. For ~0.8W (in a dual-band build) less power, the cost is 0.41 dB @ 1090 MHz and 0.64 dB @ 978 MHz (compared to the Generic Nano). The Low Power V2 dongles appear to be a good improvement over the V1 models. They are useful for applications that need low power draw, for example powering multiple dongles on a Raspberry Pi and for use on battery and solar power. The trade off for low power consumption is increased RF noise, but with the Low Power V2 dongles the noise is not significant and interestingly even outperforms the NESDR Nano 2. The Low Power V2 RTL-SDR seems to be out of stock planet-wide. Anyone know anything about that? Rumors of ETA? Stratux are producing more now, I would guess that they’ll be ready for sale in a few weeks. is it good for ais? VHF? 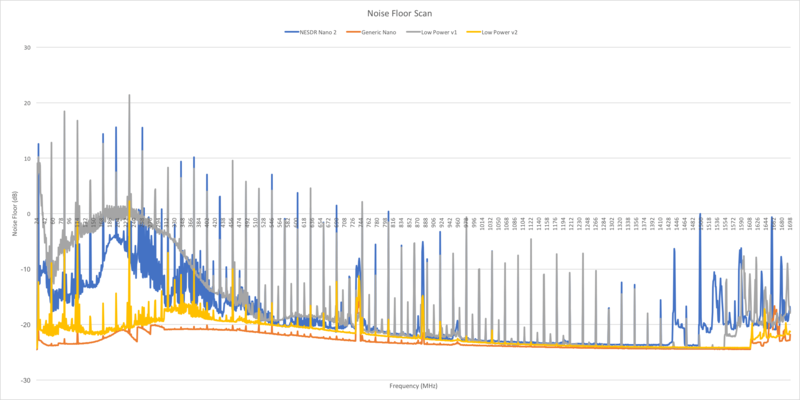 Swap “yellow” and “gray” in the noise comparison figure. What kind of antenna connector does that have? It’s an MCX connector, same one as used by most of the generic dongles.